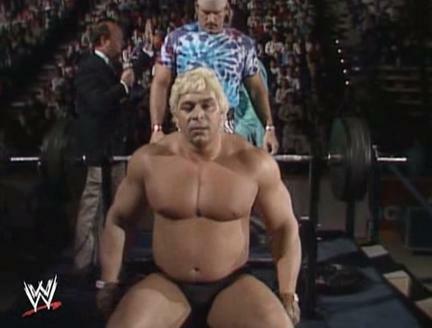 On 10 March 1993, the wrestling world lost the former WWF Tag Team Champion Dino Bravo when he was shot dead in an alleged mob hit after apparently being part of a cigarette smuggling ring. Bravo, born Adolfo Bresciano, was known by many for his run with the WWF in the 1980s. This was actually his second run with the company, his first starting in the last 70s. In March 1978, the face team of Bravo and his partner Dominic DeNucci, captured the WWF Tag Team Championship from Professor Tanaka and Mr Fuji but dropped the belts some three months later to The Yukon Lumberjacks. At the start of the 1980s, Bravo formed a short lived tag team with King Tonga – later known as Haku – but the duo received little in the way of a push and eventually went their separate ways. Bravo’s first run with the company ended in 1986 after a headline appearance in Montreal against Hulk Hogan was cancelled on short notice, the WWF’s fear being that the Montreal crowd would back Bravo and jeer their new hero Hogan. Bravo left shortly after this event. He returned to the WWF the following year with his trademark brown hair now bleached blond and he worked as part of Lucious Johnny Valiant’s stable alongside Brutus Beefcake and Greg ‘The Hammer’ Valentine. At Wrestlemania 3, Beefcake was unceremoniously removed from the group and Bravo took his place in a team with Valentine. He played up “The Canadian’s Strongest Man” gimmick as well as playing up his Québécois identity wearing the Fleur-de-lis. During this time he was managed by Frenchy Martin, whose tutelage he remained under until joining Jimmy Hart’s stable after Wrestlemania five. Bravo feuded with the then WWF Intercontinental Champion The Ultimate Warrior and also regularly teamed up with The Canadian Earthquake. Bravo would continue his strongman gimmick by doing push ups whilst Earthquake sat on his back. The duo would feud with the face pairing of Hulk Hogan and Tugboat. Following his quick Wrestlemania 7 defeat to The Texas Tornado, Bravo disappeared off WWF television only briefly returning for a series of late 1991 Canadian house shows, wrestling as a face v The Mountie before bowing out after a 1992 WWF European Tour. On the 10th of March 1993, Bresciano was found shot to death – he was 44 years old. In total some 17 shots were fired: 7 to the head and 10 in the chest and abdomen. It is rumoured that it was his alleged role in illegal cigarette smuggling in Canada that eventually led to his murder. According to close sources, Bresciano had confided to friends that he knew his days were numbered. He was a nephew by marriage of Montreal crime boss Vic Cotroni, and was believed by authorities to be involved in his organization for some time. This entry was posted in Remembering, WWF and tagged Dino Bravo, Remembering, WWF. Bookmark the permalink.